Grass is a type of plant. A common kind of grass is used to cover the ground, in a lawn. Grasses, or more technically graminoids, are monocotyledons, usually herbaceous plants with narrow leaves growing from the base. They include the "true grasses", of the family Poaceae (also called Gramineae), as well as the sedges (Cyperaceae) and the rushes (Juncaceae). 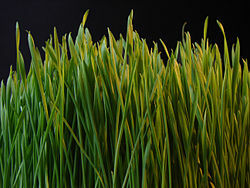 The true grasses include cereals, bamboo and the grasses of lawns (turf) and grassland. Sedges include many wild marsh and grassland plants, and some cultivated ones such as water chestnut (Eleocharis dulcis) and papyrus sedge (Cyperus papyrus). Uses for graminoids include food (as grain, sprouted grain, shoots or rhizomes), drink (beer, whisky), pasture for livestock, thatch, paper, fuel, clothing, insulation, construction, sports turf, basket weaving and many others. This page was last changed on 18 June 2014, at 09:49.